UPDATE 5 p.m.: Officials said water is back on for customers on Chester Avenue and the roads should be back open around 5:30 p.m.
UPDATE 2:45 p.m.: Officials with Public Works say that CalWater hopes to have closures on Chester Ave. and 17th St. back open by 8 p.m. today as opposed to a previous estimation of 4 or 5 p.m.
UPDATE 1:18 p.m.: Officials with the California Water Service say they hope to have closures on Chester Ave. and 17th St. back open by 4 or 5 p.m. today. 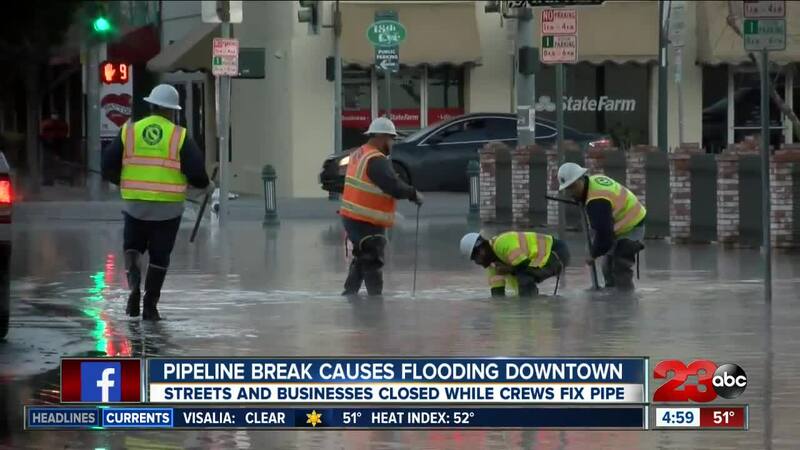 A water main break led to flooding and the partial shut down of streets in Downtown Bakersfield. Bakersfield Police tell 23ABC that crews are working to fix the water main break. The area from H Street to Chester Avenue and Truxtun Avenue to 18th Street are flooded and were partially shut down Monday. A city building on Chester Avenue and a law office both had their water shut off and despite water and porta-potties provided by CalWater, both businesses chose to close for the day.